Moscow court upholds $420 mln claim of BTA Bank against Ablyazov | Russian Legal Information Agency (RAPSI). 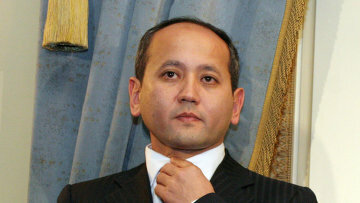 MOSCOW, March 14 (RAPSI) – The Moscow Commercial Court has granted a petition by BTA Bank demanding to uphold and execute in Russia a ruling of London’s High Court of Justice ordering to collect $420 million from bank’s ex-chairman Mukhtar Ablyazov, according to court records. The High Court of Justice granted the bank’s claim against Ablyazov, former BTA Bank Board Chairman Roman Solodchenko, companies Drey Associates Limited, Interfunding Facilities Limited, AMK-Invest, TuranAlem Capital, and Zrl Beteiligungs AG on November 23, 2012. The Kazakh bank has asked the Moscow Commercial Court to recognize claims against Ablyazov as justified. Kazakh authorities have already completed investigation into the tycoon charged with embezzling BTA Bank’s funds. Investigators claim that he has stolen pension assets and personal savings of citizens as well as loans received from foreign financial institutions. The total amount of damage caused by his actions reportedly exceeded $7.5 billion. BTA Bank ex-chairman was also charged with embezzlement, forgery of documents and abuse of office in Russia. He has been arrested in absentia. Ablyazov fled to the UK after the Kazakh government acquired a stake in BTA Bank in 2009 and the bank came under the control of its sovereign wealth fund Samruk-Kazyna. 16:45 14/03/2017 The Moscow Commercial Court has granted a petition by BTA Bank demanding to uphold and execute in Russia a ruling of London’s High Court of Justice ordering to collect $420 million from bank’s ex-chairman Mukhtar Ablyazov.